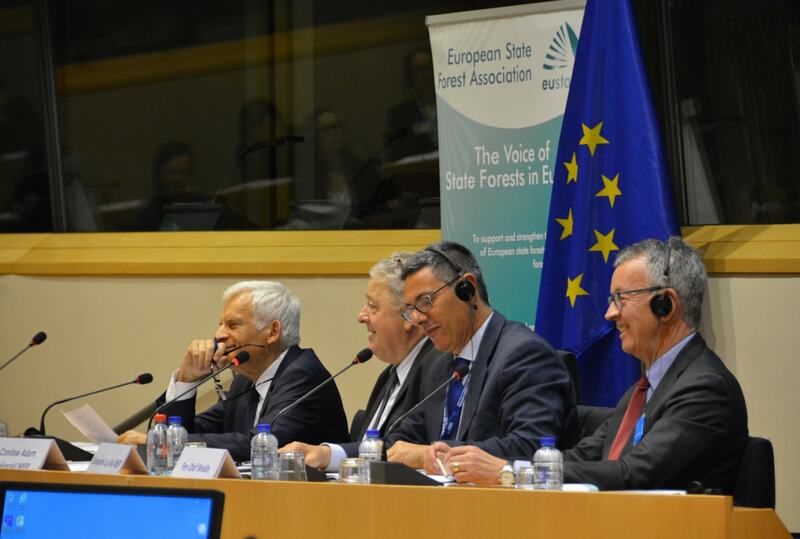 On 5 April 2016 the European State Forest Association (EUSTAFOR) organized a conference in the European Parliament (EP) in Brussels to highlight the important role of European forests in reaching the objectives of relevant EU policies, such as those concerning the climate and energy package, biodiversity and Natura 2000, and the bio- and circular economies, among others. The conference under the title “Managing European Forests Responsibly – for People, Climate and Nature” was the first of a series of events under the same title organized on the occasion of EUSTAFOR’s 10th anniversary. The three-hour conference was hosted by the Chairs of the three EP Committees which are the most relevant for the forest sector, namely: MEP Czesław Adam Siekierski (Committee on Agriculture and Rural Development), MEP Giovanni La Via (Committee on Environment, Public Health, Food Safety) and MEP Jerzy Buzek (Committee on Industry, Research and Energy). MEP Paul Brannen (Committee on Agriculture and Rural Development) co-hosted the event. Four presentations were made, followed by a stakeholder panel discussion during which the potential of European forests to contribute to the goals set out by the EU’s 2020 strategy, the EU’s 2030 climate and energy framework and the Paris Agreement (COP-21) were highlighted. Prof. Gert-Jan Nabuurs (Wageningen University, Netherlands) delivered the keynote address about the new role for forests and the forest sector in achieving the EU post-2020 climate targets. He pointed out that European forests have an additional 9% CO2 mitigation potential if the carbon storage of forests is increased by applying so-called climate-smart forestry practices. Prof. Tomasz Zawiła-Niedźwiecki, Deputy Director General of the Polish State Forests, explained how climate change influences daily management practices. He presented the concept of “Forest Carbon Farms” that can serve as a functional network of areas promoting forest management activities which enhance CO2 mitigation efforts. Mr. Humberto Delgado Rosa, Director Natural Capital, European Commission (DG Environment) reflected on biodiversity and forest management. He quoted the State of Nature in the EU report (2015) according to which most forest types and forest-related species are in an unfavorable conservation status. In his opinion forest owners and managers need to be encouraged and rewarded for keeping up sustainable and multifunctional forestry. MEP Miapetra Kumpula-Natri referred to the bioeconomy as an effective tool against climate change and noted that state forests play a key role in the bioeconomy. Decarbonization of the economy and the energy union are not possible without biomass. She emphasized that the EU’s bioeconomy should primarily be built on domestically-produced raw materials and called for a policy framework that attracts investments. MEP Paul Brannen, Harald Mauser (EFI), Luc Bas (IUCN), Fanny-Pomme Langue (AEBIOM) and Pekka Pesonen (Copa-Cogeca) joined in subsequent panel discussion which was moderated by Ms. Linda Andersson from Sveaskog and which tackled the following questions: Should Europe increase the production and use of wood raw materials? How can biodiversity and other ecosystem services be maintained if, for climate reasons, forest production is increased? What would be the best solution for forestry in the EU’s post-2020 climate change policy? All information about the conference (presentations, comprehensive summary and pictures) is available on EUSTAFOR’s website.